When you’re on the water all day, it can be difficult to keep things dry all the time. But that’s where a good dry bag could come in handy, particularly if you’re in a kayak, canoe or SUP. However, with so many products on the market offering to keep your gear dry, we thought it might be a good idea to help you narrow down your search for the best dry bags. We can give you advice on what to look for, as well as suggest some of our favorites. You might discover that there are different materials that can be used to manufacture dry bags, or indeed different variations of similar materials. Nylon and vinyl can be common fabrics but you may often find bags that are made with combination fabrics, such as polyurethane (TPU), PVC or tarpaulin. The thicker the denier of these materials, the more durable it’s likely to be. The style of dry bag you opt for will likely depend on personal preference and convenience. Some bags may only have a single strap to be worn either on your shoulder or across your body on your back. Others that have double shoulder straps can be worn like a backpack. This can be preferable if you’re traveling a longer distance on foot or if you have a larger or heavier bag. If you’re camping or fishing, for example, you may find a backpack is easier to carry, as it frees up your hands to carry other gear. While you might want to opt for a bag in your favorite color, it might be worth considering how visible it might be in an emergency. Obviously, brighter colors should be more noticeable on the water and could help attract attention if you get into difficulty. A brightly colored bag can also be easier to locate if it does happen to fall overboard. This means it can be less likely to get lost, as you and other water users should be able to see it and hopefully grab it. The size of bag you’ll need will often depend on what you plan to use it for. Just like traditional backpacks, dry bags are usually measured by volume in liters. The higher the volume the more gear it should be able to hold. If you’re looking for a bag just to keep your essentials dry for a few hours, such as your phone, wallet and a change of clothes, you should be fine with a 10 liter bag. For longer trips and multi-day trips, a larger back of around 30 or 40 liters might be more suitable. If you’re planning an extended trip, particularly if you’re on a kayak or canoe, it might be worth considering taking more than one dry bag. This could allow you to keep camping equipment dry, plus clothing, food and other essentials. Yes, they are generally designed to be waterproof. This means you should be able to keep your valuables and gear safe and dry even if your bag ends up in the water. They can be perfect for paddling trips, as well as fishing or simply a day at the beach. However, you might find that some bag manufacturers recommend that the bags are not submerged for long periods of time. But most of them are designed to withstand brief submersion. As long as the bags are sealed correctly they shouldn’t be able to let any water inside. Many will have roll top closures with buckles to secure the folds but others may have additional seals for extra protection or instead of the roll top closure. The Earth Pak Dry Bag is a waterproof dry bag that comes in a range of sizes from 10 liters up to 40 liters, meaning you can choose the size that’s best suited to your activity. The cylindrical bag is crafted with 500 denier PVC, giving it its waterproof exterior, and it closes at the top by folding it over before being secured with buckle straps. It’s designed to keep your belongings inside dry, even if the bag falls overboard. It’s also built to float. The 10 and 20 liter bags each come with a single shoulder strap, while the larger ones feature backpack style straps to make it easier to carry heavier loads. The 20 liter one could be an ideal choice for a day on the water, with room for a towel, spare clothes and shoes plus your valuables. 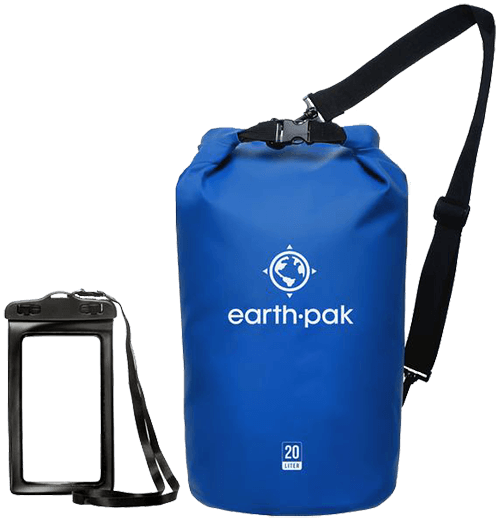 The Earth Pak bag also comes with a waterproof phone case that can give additional protection to your cellphone whether it’s inside your bag or loose on the deck. The Freegrace Waterproof Dry Bags come in a set of three, including a dry bag, a waterproof waist pouch and a waterproof phone case. You can choose from a range of sizes for the dry bag, from 5 liters up to 35 liters, which all come with the additional pouch and phone case. This dry bag features double strip closure seals, similar to a Ziploc bag. These seals mean the bag doesn’t have a roll top closure but is designed to keep your belongings dry, even if the bag gets submerged. The waist pouch features a similar closure but with a triple seal and, as long as the seals are completely closed, it’s built to be submerged under water. It can be ideal for keeping your phone or wallet safe while paddling. The dry bag is made from 500 denier tarpaulin for added durability and each size features a single adjustable shoulder strap, except the largest size which benefits from backpack straps. The CC-JJ dry bag is a 25 liter waterproof bag that can be ideal for a range of watersports. The PVC bag features a roll top closure that requires 3-5 rolls before you can secure it with the buckle, which locks it in place. 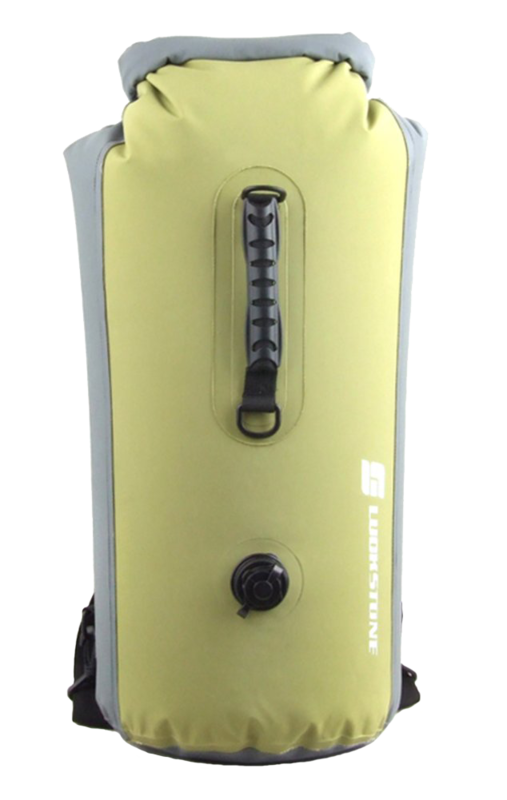 Its 25 liter capacity can be ideal for an overnight trip, with room for a change of clothes, spare shoes, and some food. This waterproof dry bag benefits from backpack style straps to make it more comfortable if you have to hike anywhere, and it also has a small grab handle for convenience. There are also D-ring clips on the front of the bag that can let you attach additional items and tie it down on your kayak or paddleboard. The Marchway Floating Dry Bag is a waterproof bag made from 500 denier tarpaulin, designed to keep your gear dry whether you’re canoeing, kayaking or fishing. The bag comes in a choice of sizes depending on your needs, ranging from 5 liters up to 40 liters and also a variety of bright colors. To close the bag, you simply roll the top a few times before securing in place with the buckle strap. Both the 20 and 30 liter bags come with detachable straps so you can choose to use backpack straps or a single cross-body strap. The smaller sizes only have a single strap and the 40 liter option has only backpack straps. When the bag is sealed it’s designed to float, so it should be easily retrievable if it falls overboard. This Unigear Dry Bag is crafted from durable polyurethane coated nylon, which is waterproof. It’s not designed to be fully submerged for a long period but it is designed to keep your gear dry if it falls overboard or if it’s underwater for a short time. It comes in a range of sizes and colors to suit your needs and tastes, and comes with a touchscreen friendly waterproof case for your phone, so you can still use it while it’s in the case. The dry bag has a roll top closure with a buckle lock and all the bags up to 20 liters in size come with a detachable single shoulder strap. The two largest bags both come with padded shoulder straps so you can wear them like a backpack. The bag is also designed to float. 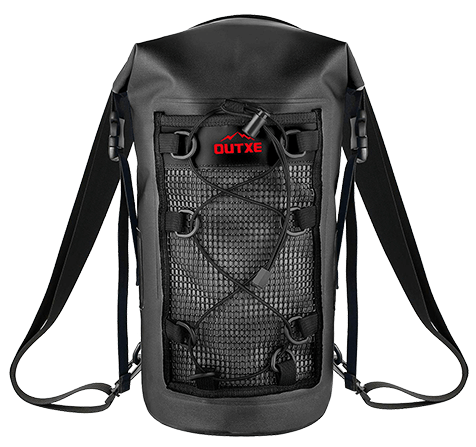 The Outxe Dry Bag is a waterproof dry bag backpack that comes in a choice of two colors and ranges in size from 5 liters to 20 liters. The 5 liter option has a single strap and not double backpack straps. It’s made from lightweight, durable 420 denier TPU (thermoplastic polyurethane) and features a patented Zipock seal, like a Ziploc freezer bag, that helps to prevent water from getting inside. This gives extra water protection in addition to the roll top closure. It also has welded seams for all over waterproofing. All sizes of the bag have detachable shoulder straps and the 10 liter and 20 liter options feature a front mesh pocket, D-rings and cord so you can carry extra items if you need to, and can easily secure it to your vessel. 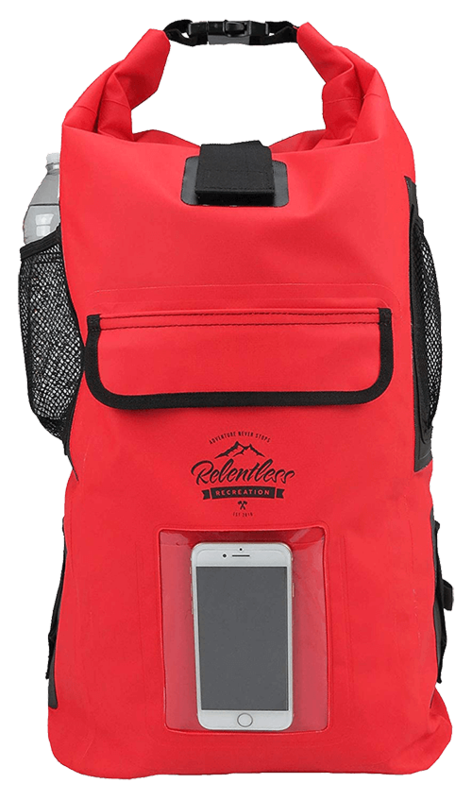 This Relentless Recreation Dry Bag is a 30 liter waterproof backpack that could be ideal for holding clothing and food for a couple of nights away. Made from 500 denier Polyvinyl tarpaulin, it’s built to be durable and keep all your belongings dry. It even features a small front pouch for your phone, although this is not billed as waterproof so you probably don’t want to have your phone in the pouch if your bag goes overboard; but it is splash proof. There are also mesh side pockets that can let you store a couple of water bottles. The bag features a roll top buckle closure, a reinforced carry handle and paddle shoulder straps to wear as a backpack. 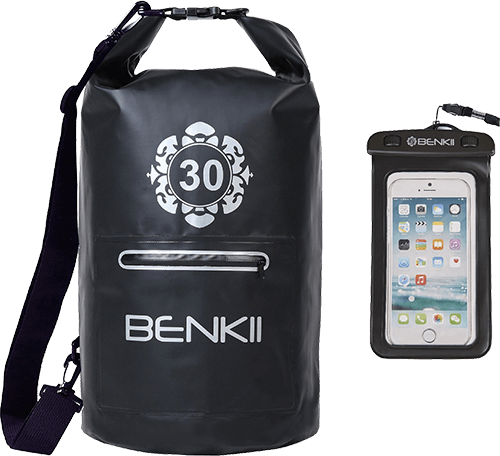 The Benkii Dry Bag comes in a range of sizes to suit your activity so you can get one that fits in as much or as little as you want. This waterproof bag has a roll top and buckle closure and benefits from a small front pouch for smaller items. It comes with a shoulder strap for carrying and also comes with a separate waterproof phone case. The D-rings that the strap attaches to can be equally ideal for using to secure the bag to the deck of your kayak or canoe with some bungee cords. The best dry bag will often depend on what you’re looking for. Think about what you need to keep dry and whether you can get by with a smaller bag or if you’ll need a couple of different sizes. Remember to think about the style and what might suit you best. Let us know in the comments if you have a particular favorite style or size of dry bag and what you use it for? And don’t forget to share this with your fellow outdoors people.